If you could give your version of optimal living a nickname, what would it be? What values power your optimal living? 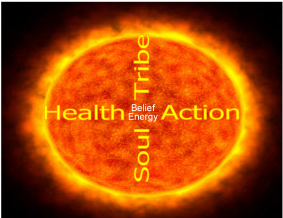 Belief Energy is my nickname for optimal living. I arrived at it in March of this year journaling on a bus near Reno after spending three lonely days at a smokey casino on Lake Tahoe. My life at the time was good, but it wasn’t great. It didn’t resemble my optimal live chapters from my past when I was firing on all cylinders. My career was on a very rocky road. I was alive, but not fully feeling or living. I wasn’t being 100% honest either. I knew my core values hadn’t changed, but I wasn’t as mindful of them and living IN them. I was outside the break and tired of paddling for momentum. I was asleep and needed to wake up. Excited and those around me knew it. Carried by endless amounts of energy. Finally! On that bus ride I woke up, and realized that my previous peak life chapter could be repeated and better yet, taken to a whole new level and sustained! I’d finally paddled into a great wave. Tears of excitement and hope burst from my eyes when this inner awareness arrived. I got on my i-phone and bought the BeliefEnergy.com and BeliefEnergy.org URL right from the bus. I called a few members of my tribe and told them a new peak life chapter had begun again and to buckle up. find ways to sustain optimal living using my values as a life compass. Below I offer a definition of my Core4+2 values and how I live IN them. My goal is not to coerce you to define optimal living or your values, barriers, path, decisions and integrity my way. It’s to inspire you to contemplate, discuss and experience optimal living in your own way. If my perspectives and experiences get you started or give you an extra boost, all the better. Please take a leadership role in this conversation based movement. Teach us what you know. Invite others to the conversation and inspire them to teach us too! Near future pages will offer my definition of barriers, path, decision and integrity. For now, however we’ll stick to the Belief Energy definition (above) and the Core4+2 Values definition below. I hope sharing my definitions inspires you to draft your own. The “Your First Assignment. Belief Energy” found on the BeliefEnergy.com homepage and the assignments found in every post on this site are designed to get you thinking and moving ever closer to your version of Belief Energy! 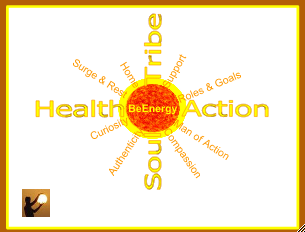 The Core4+2 values, an expansion of my Core4 values, reach into every area of my life and power my Belief Energy. Soul (I’m myself at all times- Authenticity. Giving and receiving equally- Compassion). Tribe (I come home to myself, being present- Home. Giving and receiving recognition and assistance- Support). Health (I’m mentally fit and always listening- Curious. Balanced surging AND resting with passion- Surge & Rest). Action (Never backing down, living fully, overcoming barriers- Man of Action. Mindful of the present AND the path- Role & Goal). Reflect on and cherish every aspect of Belief Energy.